Keeping your furnace running at it’s peak performance is very important to most homeowners. Make sure you schedule yearly inspections for your furnace and air conditioning with a licensed professional. They have the knowledge and the tools to get the job done right. They are prompt ,courteous and professional . Change your furnace filter often . Change it every 30 days if you have pets. In Colorado it is so dusty we recommend changing the filter at least every 60 days. This will help extend the life of the furnace and air conditioning system . Keep combustible material away from furnace area . Recommended clearance is 30″ in front of any appliance. Paint cans or any chemicals will easily catch fire if they are too close to the furnace . Safety is important. Keep carbon monoxide batteries are fresh and the detector needs to be within 15 feet of a sleeping area. Change batteries in your thermostat yearly. I try to do it when the time change happens. Save for a new system . If your system is over 13 years old. New technology and more efficient units come out every year. We recommend replacing your furnace when it is over 13 years old . Otherwise it could start costing you money or leave you without heat on a cold night or weekend when rates are expensive. We sell Amana and Goodman furnace and air conditioning units. furnace repair is expensive. So here are some tips to help keep your expenses down and your furnace running efficient. Replace filters on your furnace often . When it is running daily on cold days it is taking in all the dirty air and running through the blower motor. Change the filter at least every 60 days or more often . 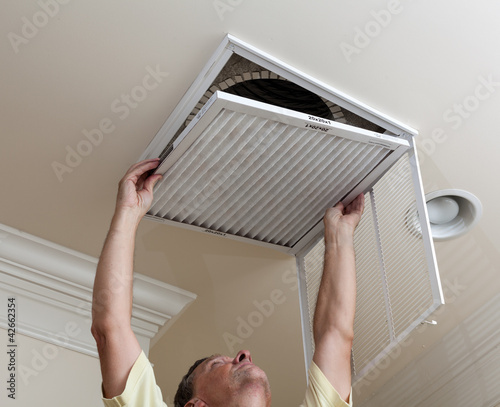 When you do remodels or any sort of home improvement the dust enters into the furnace and if the filter is not clean all this dust and dirt will pass into the motor and cause the furnace to shut down on high limit. Not good. You should have your furnace and air conditioning inspected yearly. If not inspected your hvac system could shut down on the coldest winter day and you may be without heat for a long period of time . We do a 15 point inspection. We check gas pressure . Amp draws. We check for carbon monoxide. We make sure the furnace is safe. The average life span of a furnace is 10-15 years. Inspections will help prolong the life of you hvac system . Neglect shortens the life . After that time we recommend replacing the furnace due to part failure and parts wearing out. The furnace also is not as efficient as it used to be when it was brand new . So an 80% efficient furnace installed 20 years ago is probably now about 50% efficient and is costing you alot more money on your gas bill . We recommend having your duct work cleaned every 5-10 years . This depends on if you have pets and where you live. If you do replace your furnace your duct work should be cleaned . It will make the process of changing out the furnace a cleaner job . Less dust blowing around. Replace batteries in your thermostat every year. I recommend you do the battery change out when the time changes . Programmable thermostats are great. I recommend leaving the thermostat set at your favorite setting and leaving it. It is easier for the furnace to keep the house at the same temperature. Instead of trying to bring the house to temperature on a cold day . This causes alot of stress on the internal parts of the furnace . 1)Replacing a furnace is a major expense. Know the details about the furnace…. such as the quality of the product. What the blower tonnage is. Is it sized right for my home. All these things are important to make your home more comfortable when it is heating or cooling your home . Did you know that if your duct work is under sized you should really have at least a two speed furnace installed or a variable speed. The blower will run at a lower speed on a warm day and make the house more comfortable . Instead of turning on and off at one speed to blast heat into the home. I have received some calls from homeowners who have installed their own furnaces. Purchased them off the internet. I would question if there was ever a problem with the furnace(fire) if insurance would pay a claim . This is something you should discuss with your agent and see if it is covered. Sometimes it pays to have a licensed professional to change out your furnace or air conditioner due to liability . Permits are required in alot of cities if you change out a furnace. It also helps with selling the home . Buyers like to have that guarantee that nothing is wrong with the installation. Fire can catch anyone off guard . Home fires are unexpected and move through the home fast. Smoke detectors and carbon monoxide detectors on every floor near every bedroom are a great idea. Safety first. One exposed wire or improper installation of any gas fired appliance could become a huge mistake . Guessing or practicing on your own furnace is probably not a good idea. Hiring a licensed professional who has done the training is a better idea. It may cost you some money….but isn’t it worth it for your peace of mind and your families safety? Vent system to be checked for blockage and/or leakage. Combustion gases to be analyzed. Blower access door to be checked to confirm a tight seal at the furnace. Fresh air intake to be checked for blockage. Heat exchanger to be inspected for corrosion or rust. Burners to be checked for proper ignition. Drainage system to be checked for blockage and/or leakage. Blower wheel to be checked for debris and cleaned if needed. Amp-draw test to be performed. Wiring to be checked for corrosion and/or damage. Static air pressure checks, gas pressure testing, and temperature rise checks to be performed. Filters to be changed. (This should be done by the homeowner more frequently than annually). Not all HVAC companies or technicians perform all of the above services. When receiving a quote for the maintenance, ask what all the service includes. Furnace manufacturers all recommend annual inspections and maintenance by a qualified technician. They also state in their warranties that damage to the units caused by improper maintenance is not covered under warranty. This does not mean that an annual furnace check-up is required, but it is recommended to avoid the chance of voiding the warranty. When your furnace quits working or it is not keeping your house up to temp. Make sure to check your furnace filter before you call us to come out. It could save you a lot of money. If you have pets we recommend you change them every 30 days. Replacing the old furnace in your central heating system with a new, more efficient furnace can offset your energy prices. Money aside, today’s furnaces’ pollute less and can boost more comfort by producing more heat though out your home than older furnaces’. How do most people know when to go about buying a new furnace? Well in this case size really does matter, it matters a lot. The furnace’s speculations should fit your needs. A furnace that is too small won’t heat your house comfortable during extremely-cold weather. Efficiency also matters. Gas is currently the most common heating fuel and most new central-heating systems use gas. How efficiently a furnace converts gas into heating energy is reflected in it’s annual fuel-utilization-efficiency rating, which is measured by the percentage. The higher the number, the more heat the furnace can wring from each therm of gas. Since furnaces few emissions, environmental consideration might also influence your decision. Modulating Heat-Provides superior comfort over traditional single-stage and two stage products, further reducing temperature sings in your home. Variable speed fan motor-By changing the speed of it’s over flow during start up, your furnace can adjust humidity levels and create more even temperatures though out your home, while enhancing efficiency and reducing operating noise. Quiet combustion technology – uses a smaller Btu input burner for quieter start-up and operation while providing more even heat distribution. EHX technology- Armstrong Air’s propriety heat exchange design is made for stainless steel for corrosion resistance and maximum strength against thermal fatigue caused by repeated heating and cooling. Advanced air flow properties eliminate hot spots and distribute heat more evenly than conventional designs. All of these combine to extend the life of the heat exchanger. Please go to energystar.gov to see more furnaces and to read more about the features. You can make your home energy efficient in several ways. Turn down the thermostat in winter; just two degrees cooler will save you money. Draw the curtains at night to block the chill from a cold window. Keep the windows covered on a sunny days during the summer, and uncover them on sunny days in the winter to benefit from some free solar heating. Reduce heat loss from ducts by sealing leaks and, if needed installing ducts.